Libyan rebel fighters launched offensives on two fronts to the south and east of Tripoli on Wednesday in the biggest push in weeks towards Muammar Gaddafi’s stronghold in the capital. 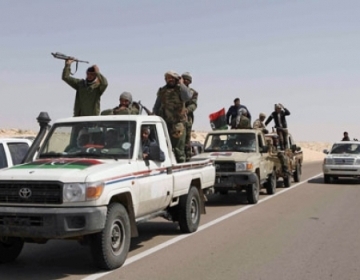 In the Western Mountains southwest of Tripoli, hundreds of fighters advanced towards the government-held village of Al-Qawalish, while on the Mediterranean coast east of the capital, rebels pushed westwards from the city of Misrata. The advances came as reports proliferated that Gaddafi — under pressure from a five-month uprising against his rule, sanctions and a NATO bombing campaign — was seeking a deal under which he would step down. His government has denied that any such negotiations are under way, but a senior Libyan official told Reuters on Wednesday there were signs that a solution to the conflict could be found by the start of August. Western Mountains rebels travelling in Toyota pick-up trucks arrived at first light to launch their attack on Al-Qawalish. Many had anti-aircraft guns welded onto the truck beds. Several tanks were also brought to the front on lorries. The rebels began firing rockets and mortars at dawn, cries of “Allahu Akbar!” or “God is greatest!” echoing through groves of olive, almond and fig trees with each outgoing blast. Gaddafi’s forces responded with intermittent volleys of Grad tactical surface-to-surface rockets. Clouds of black smoke came from the hillsides where the incoming rounds exploded. The rebels’ aim was to push the 10 km (6 miles) from the town of Al-Qalaa to Al-Qawalish. The fighters were pushing south-east, away from the capital, but taking Al-Qawalish is strategically important because beyond it, further to the east, is the larger town of Garyan which controls the main highway north to the capital. After several hours, the rebels had advanced a couple of kilometres towards Al-Qawalish and NATO warplanes could be heard in the sky. Ambulance workers said they had treated about six people with injuries. Fighting across Libya has been largely static for weeks. In the eastern third of the country, rebels are unable to break through to the oil town of Brega. Misrata’s rebels made a push towards Tripoli in May, soon after forcing Gaddafi’s forces out of the centre of the city, but since then they have made only incremental advances. The last rebel advance in the Western Mountains was last month when they pushed 30 km north to the outskirts of the town of Bir al-Ghanam. In the past, rebel advances have frequently become bogged down or quickly turned into a retreat. Near Misrata, rebel commanders told Reuters they had pushed 20 km west overnight, taking them to within about 130 km of Tripoli. Reuters journalists were unable to confirm the advance independently because it was not possible to reach the front line. The new rebel positions were coming under intense bombardment from Gaddafi’s forces who were using mortars, artillery and Grad rockets. A Reuters reporter at a field hospital in Dafniya, on the western outskirts of Misrata, said he could hear the sound of ordnance landing every few seconds. He saw three wounded fighters brought into the field hospital. The stretchers on which they were brought in were quickly washed down and sent back to the front line to transport more wounded. Fighting in the same area on Tuesday killed 11 rebels and injured dozens more, medical workers said. Gaddafi, who has ruled oil producer Libya for 41 years, has said the rebels are armed criminals and al Qaeda militants. He has described the NATO campaign as an act of colonial aggression aimed at stealing Libya’s oil. A Russian newspaper this week quoted what it described as a high-level source as saying that Gaddafi is sounding out the possibility of stepping down on condition that there is a political role for one of his sons. A Libyan government spokesman denied that report, saying Muammar Gaddafi’s future was not up for negotiation. Libyan Deputy Foreign Minister Khaled Kaim said in an interview with Reuters in Tripoli on Wednesday, said a solution to the conflict could be found before the Muslim holy month of Ramadan begins early in August. He did not give any details about what that solution might involve, however. “There are signals that the crisis will find a solution in the coming weeks. We will do whatever possible so that our people will spend Ramadan in peace. So we hope that a solution will be possible before the month of Ramadan,” he said. Responding to reports of a possible deal, several NATO states have said the Gaddafi family must relinquish all power. “We believe that there will need to be a political process at some stage within Libya but it needs to be completely understood that Gaddafi and his family have no part to play in the government of the new Libya,” David Lidington, Britain’s minister for Europe, told reporters on a visit to Moscow.